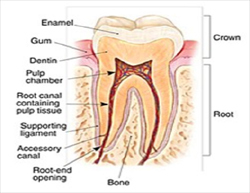 What is Endodontics (Root Canal Treatment)? 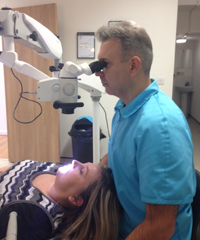 Endodontics is a speciality of Dentistry that deals with diseases of the dental pulp and its supporting structures. Endodontic Treatment is an economical way to preserve a tooth in function especially when the cost of tooth loss and replacement is so high. In order to understand what Endodontic Treatment or Root Canal Treatment is, it helps to know something about the anatomy of a tooth. The outside layer of the tooth is made up of a hard layer called Enamel. The Dentine layer which is protected by the Enamel layer has at its centre a soft tissue known as the Pulp. The Pulp contains blood vessels, nerves, and connective tissue that are responsible for forming the surrounding Dentine and Enamel during tooth development. The Pulp receives its nourishment supply from vessels which enter the end of the root. Although the Pulp is important during development of the tooth, it is not necessary for function of the tooth. The tooth continues to be nourished by the tissues surrounding it even after the pulp is removed. 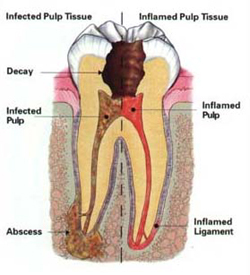 Endodontic Treatment or Root Canal Treatment is necessary when the Pulp becomes inflamed or infected. The most common reasons for inflammation or infection are deep cavities (caries), repeated dental procedures, cracks or chips. Trauma can also cause inflammation and often shows up as discoloration of the tooth. Tenderness of the tooth especially to biting or adjacent gums. Sometimes there are no symptoms and the first sign of a problem maybe radiographic evidence confirmed with additional diagnostic testing by the dentist.